“Make sure the water does not freeze. To do this, place a thick, well-insulated bowl of warm water in a sheltered place, change the water on regular basis or get a water heater. You should also make sure that there is a dry, snow-free place in the run. You can regularly mix leaves with some wheat grains so that the animals have something to pick. A dry corner with sandbathing possibility must not be missing. Different perching options should always be available during the day anyway, but especially in winter: this helps keeping their feet warm! Depending on the circumstances, a windcover should be installed at chicken height so that the animals are somewhat protected. 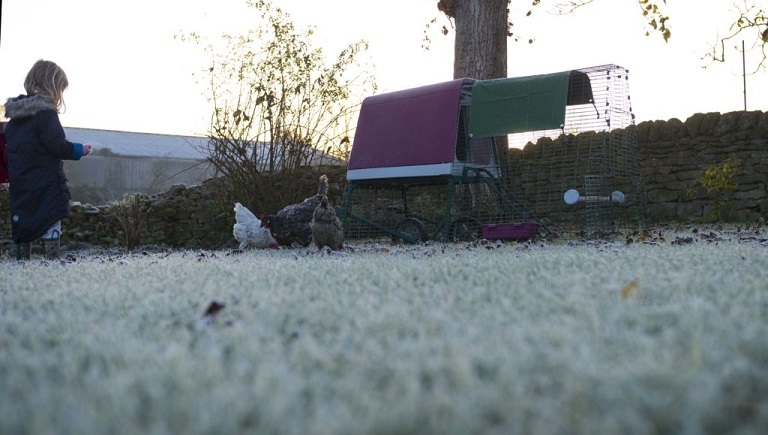 You can easily turn the Eglu run into a sheltered, snow-free area. There is are a range of weather protection covers available at Omlet or you could use simple greenhouse film, combined with bubble wrap. This way the run will be a few degrees warmer and windproof on the inside. 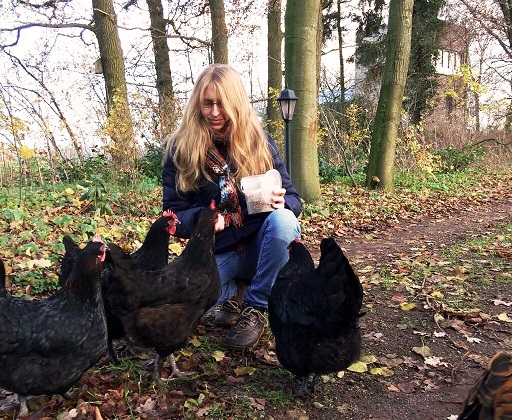 In order to help the chickens saving energy and make it a little bit more comfortable for them, you can get an extreme weather jacket for Eglu coops or use tinfoil as it can be found in emergency blankets. The dropping tray can be additionally insulated with an extra thick layer of straw or newspaper. But after all the easiest way is to use the Omlet extreme weather jackets which makes sure that there’s still a good insulation on the inside of the coop. Pay special attention to the inside of the coop, because the exhalations of the excretions will otherwise accumulate quickly in the interior and irritate the respiratory tract. Good ventilation is also important to remove the humidity, so that the animals do not catch a cold. A few extra vitamins in the form of fruits, vegetables and herbs can help the immune system. Also onions, garlic and leeks shredded with vegetables or mixed with “flavor enhancers” such as oatmeal, grated carrots, yogurt and oil are very popular. Eglu chicken coops and rabbit hutches do not absorb water so they don’t get heavy and remain easy to move. They have insulation built in so remain warm. They have draft free ventilation so your pets wont get a nasty chilly breeze coming in. The door locks are made from heavy duty steel and wont break even in the freezing weather. The door handles are all made from plastic so your fingers won’t freeze to them. The door handles are nice and big so you can use them with gloves on. The water container is really quick to lift out so you can take it in at night to prevent it from freezing. Looking to upgrade your Chicken Coop? Click here to find out more about the different types of insulated Eglu coops, plus get FREE Delivery if you order before 21st December. Just quote SANTAPAWS at checkout.